The town of Litchfield has always been interesting to me. Everyone is familiar with its fancy dan “downtown” area; with it’s restaurants and high-end shopping. But outside of that strip through the center of town, Litchfield gets a little weird. There are a lot of unique little places around town, and I’ve had fun over the years exploring them. I can’t pretend a walk around the Litchfield Hills Audubon Society’s Wigwam Brook Wildlife Sanctuary is on par with some of the other stuff hidden around town, but it is interesting nonetheless. Damian and I checked it out while waiting for our Thanksgiving turkey farm to open. That’s right, I drive out to northwest Litchfield to Bunnell Farm for our fancy dan turkey. Only the best for my family. I even wrote about it here. Imagine my surprise to find another car in the parking lot on a Tuesday afternoon in the middle of nowhere, Litchfield. The trail here is a “square loop” on a hillside. 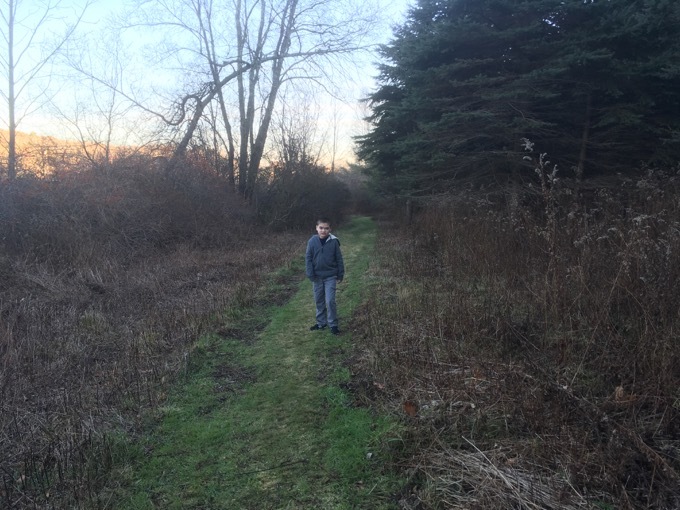 Wigwam Brook Wildlife Sanctuary, located along Connecticut’s scenic Route 254 in Litchfield, is a landscape that has seen many changes over the years, some man-made and others by nature. Mowed fields and stone walls show evidence of former farmland, and an overgrown Christmas tree plantation, (now a haven for many birds) demonstrate another agricultural practice. 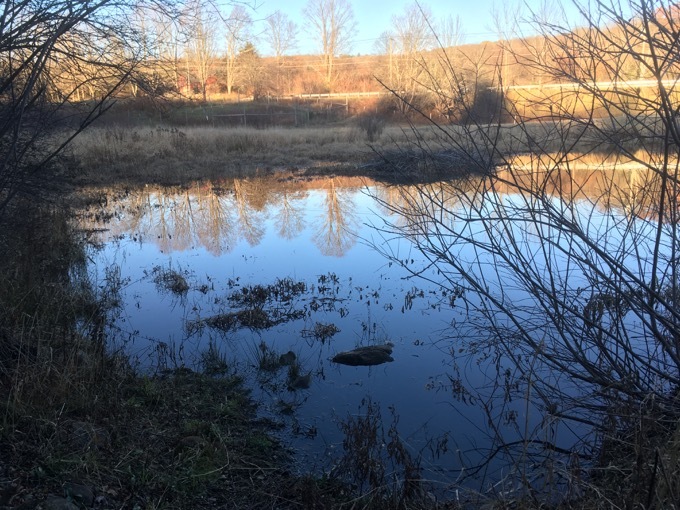 Wigwam Brook, the sanctuary’s namesake, tranquilly flows the length of the property, ponding up now and then along the way, thanks to industrious beavers. 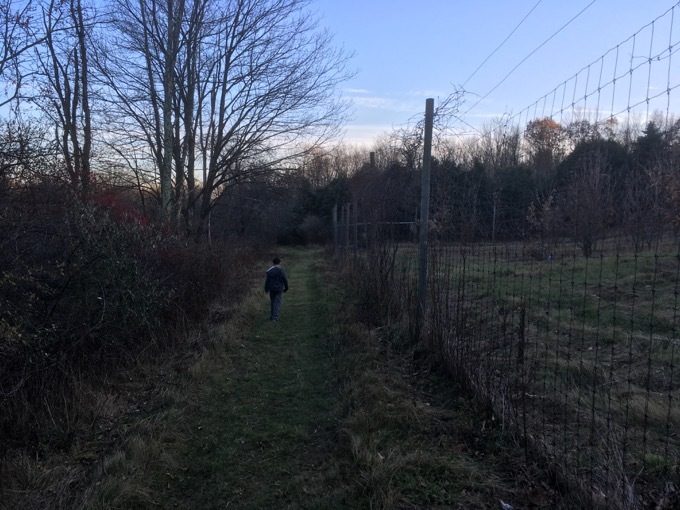 The 36 acre property was acquired in 2008 and Litchfield Hills Audubon Society has been devoted to preserving existing habitats, and enhancing others to attract threatened wildlife species. Change continues as volunteers plant trees and shrubs for wildlife. 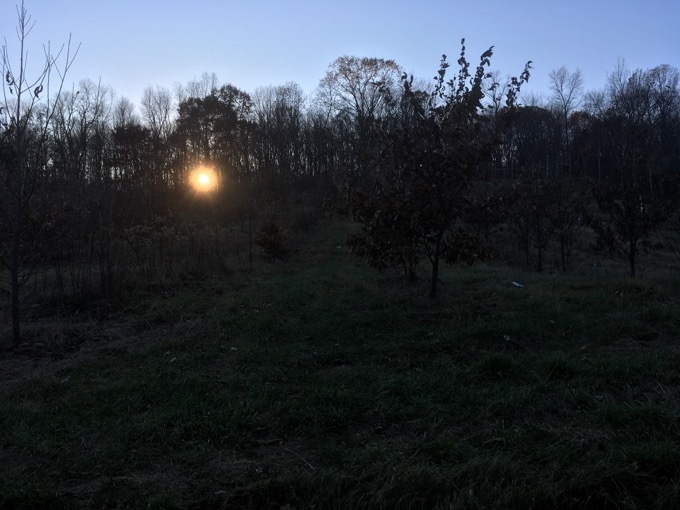 Two American Chestnut orchards, totaling 2 acres, have been planted and managed to help restore this magnificent tree to its former grandeur. 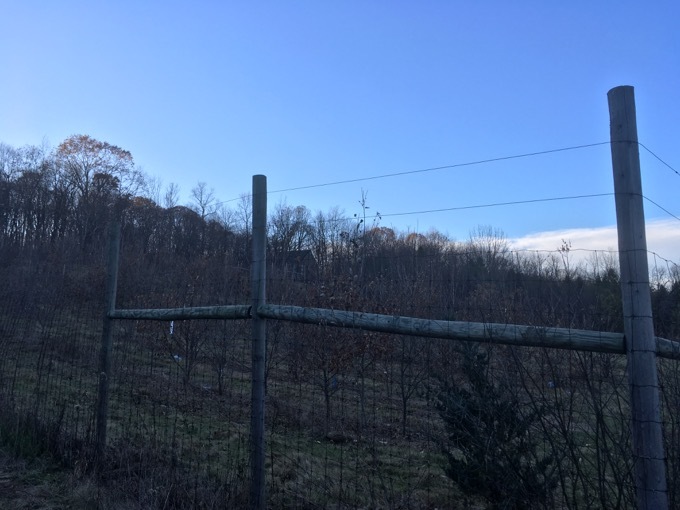 That’s right, the hillside is home to one of Connecticut’s rare chestnut orchards. It is protected by a high fence. 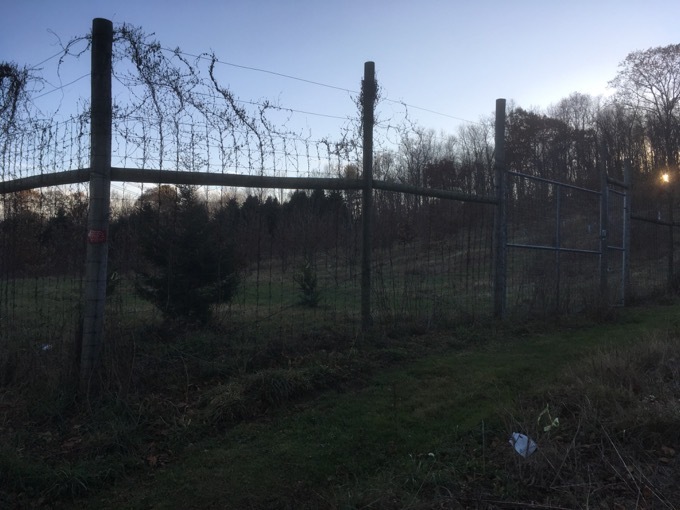 The fencing is to fend off deer, but it is quite imposing to humans as well. 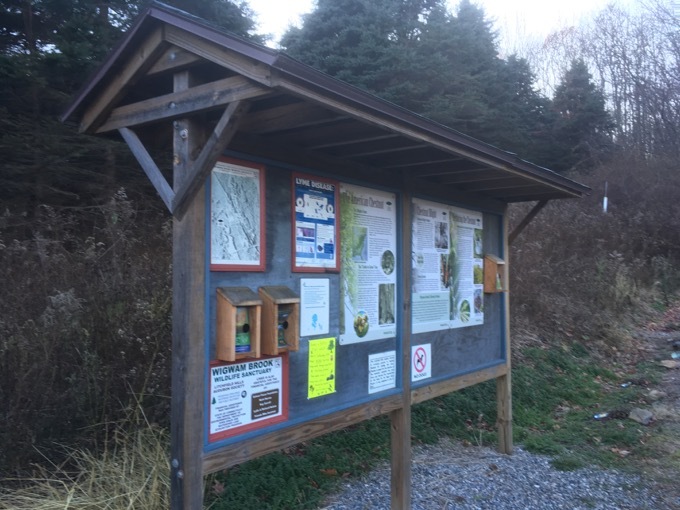 There are informational signs at the trailhead about the chestnut program in the US; all about the blight that killed off the trees over the course of the 20th century. 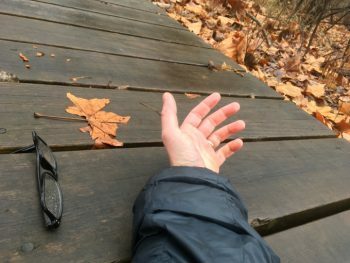 An estimated 4 billion with a b chestnuts were killed, wiping out about 200 million acres. It is often cited as the greatest ecological disaster of the 20th century. 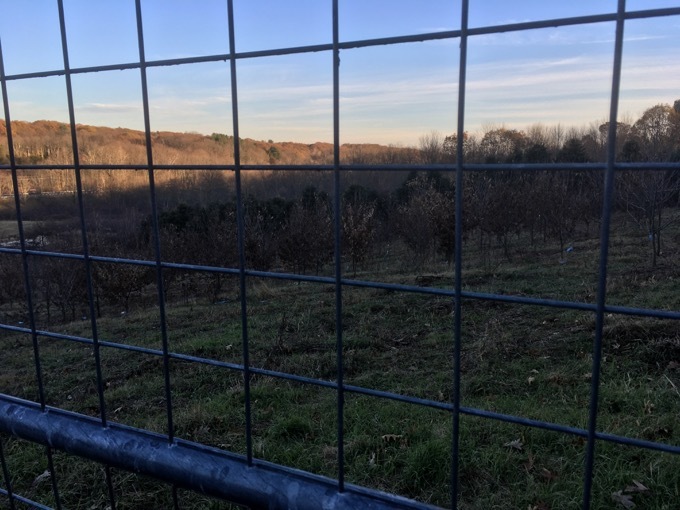 Enterprising ecologists have been trying to reintroduce blight resistant chestnuts up and down the east coast and the LHAS has partnered with the American Chestnut Foundation to get a grove going in Litchfield. It’s a tricky thing, because chestnut trees can grow for years, up to 30-feet high, and look fantastic and then, boom. We saw the other car’s owner down near the beaver pond doing what people are supposed to do in Audubon properties: birding. They seemed just as startled to see us bumbling about. 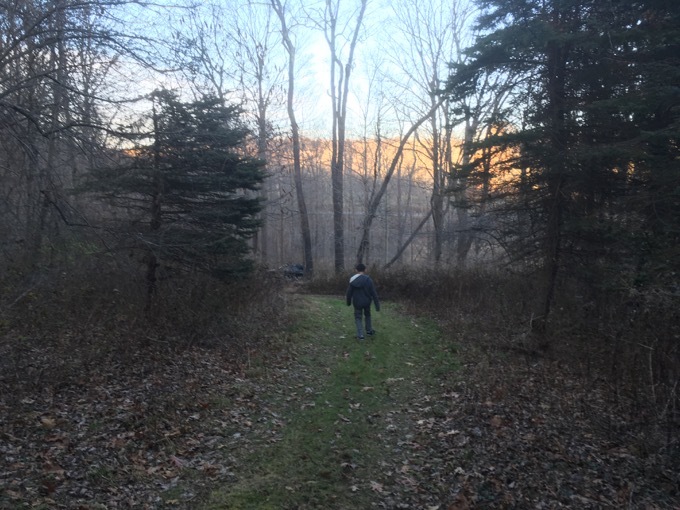 Wigwam Brook is a nice little property and I hope their chestnut program works out. I haven’t kept tabs on how the other experimental orchards around the state are doing (I know there’s one near Sleeping Giant), but I wish them the best of luck. Even if “chestnuts roasting on an open fire” is one of the worst smells I can think of. You should check out the new “Bones & Bottles” Trial directly across the street from the trailhead.